When you want to find a key Bible topic fast, turn to Explore Your Bible—it provides nearly 2,500 references on 199 important subjects. Bible concordances are valuable tools, but unless you know the exact word to search for, you might miss an important truth. 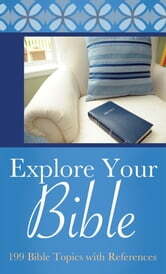 With Explore Your Bible, you’ll search by topic—from “Access to God” to “Fear, Unholy” to “Zeal,” each topic features several references under helpful subtopics. Useful for personal or group study, Explore Your Bible will encourage you to dig deeper into God’s Word—and get more from it!